Boho Vibes and Give away winner! Hey lovely ladies, hope all is well this Friday! I have had a super dooper productive day! See, i have been going through a right lazy bum phase where i don’t feel like doing anything and generally just tired allll the time. On our anniversary the other day hubs and i got to chatting and we both agreed that we need to kick ourselves ad each other up the backsides and start doing more. Since then we have. Today i walked to the supermarket and back with Neo and a pram laden with food, then i have started the EPIC task of sorting my bedroom and all my clothes. So far i have 4 huge bags filled for charity and also a whole other pile for Ebaying. And d’you know what? It feels so good, i feel good having gotten rid of so many un-needed/wanted clothes, shoes, bags etc. Excessive amounts are just un-necessary. This hoarder may be changing her ways!! I’m still right in the middle of it so there’s still more to go tomorrow but its good! I’m getting there. Once done we are treating ourselves to a nice new bed which is much deserved! So life feels good right now.. I really love maxi dresses/ skirts. They are just uber comfy and practical. Chuck on some wedges and a floppy hat and i am good to go. I like easy peasy outfits. Enough chit chat, thank you all so much for entering my giveaway, I’m such a softy i truly wish i could give everyone a prize as i really truly appreciate you all coming to my little blog. So big virtual hugs to you all! I am going to be doing this regularly as i really want all you guys to have a little something from me to you so watch this space as shortly i will be have some new goodies up for grabs. Well you all have lovely weekends! do you have nice plans? My real life and blogger friend is throwing her sons a joint party. She throws the most amazing parties ever, last one there was a fairly land and an ice cream parlour! She blows my mind with her ideas. You can check some of them out over on her crafty blog where if you’re looking for party ideas, she has lots! Previous Post Honey’s I’m home!! I love that hat so much. I'm totally on the look out for one just like it. And that maxi dress is adorable. I love the jewelry you paired with it. I love the hat too, you look gorgeous!! I love the shoes especially. And the hat. And the dress… Lol. I don't suit hats – I'm do jealous of anyone who does! That dress is really pretty and it looks great with the hat 🙂 I need to have a big clear out too. Hope you had a nice time at your friends party! 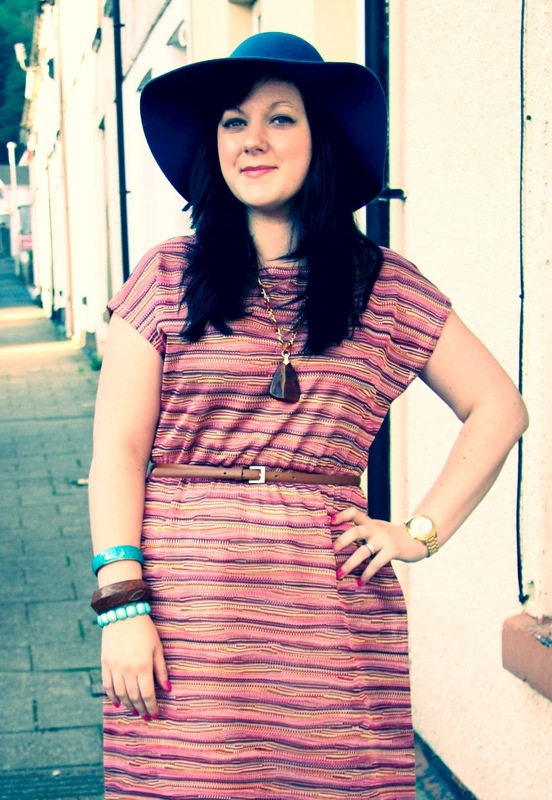 Spring is the best season for getting rid of unwanted clothes and for sorting our closet out! 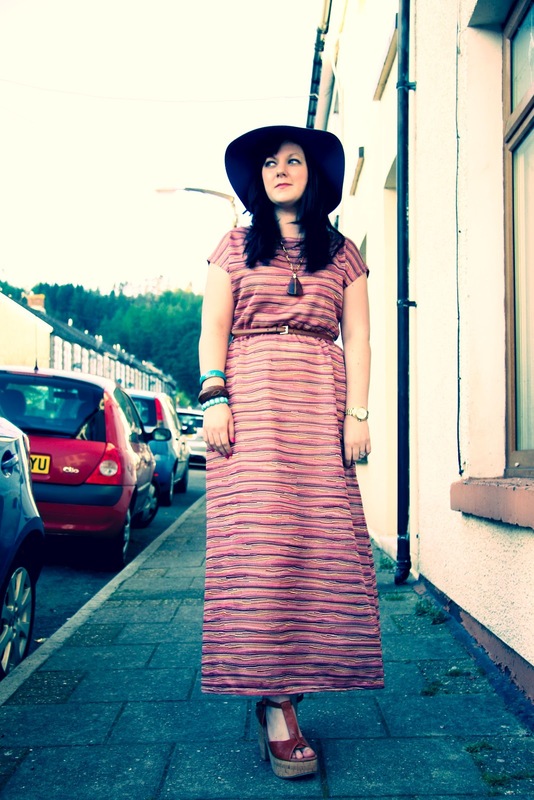 You look great, a maxi dress paired with a floppy hat is just a perfect combination <3 and I adore your shoes. Love this! 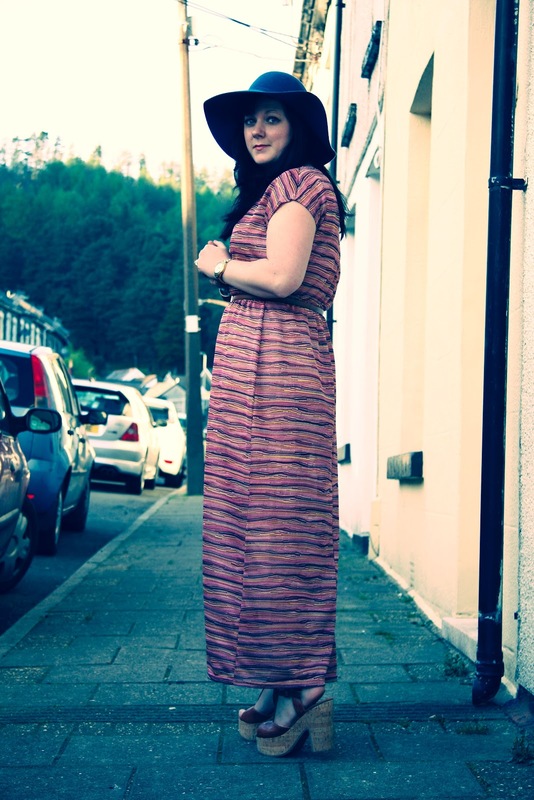 Maxis are the best for making a look feel super pulled together with minimal pieces. The hat totally tops off your look! Fun dress and hat. You look awesome! The dress is dreamy and I do love a good closet clean-out. Congrats on the new found energy. Thanks so much for sharing on Monday Mingle. That's boho chic at its best! 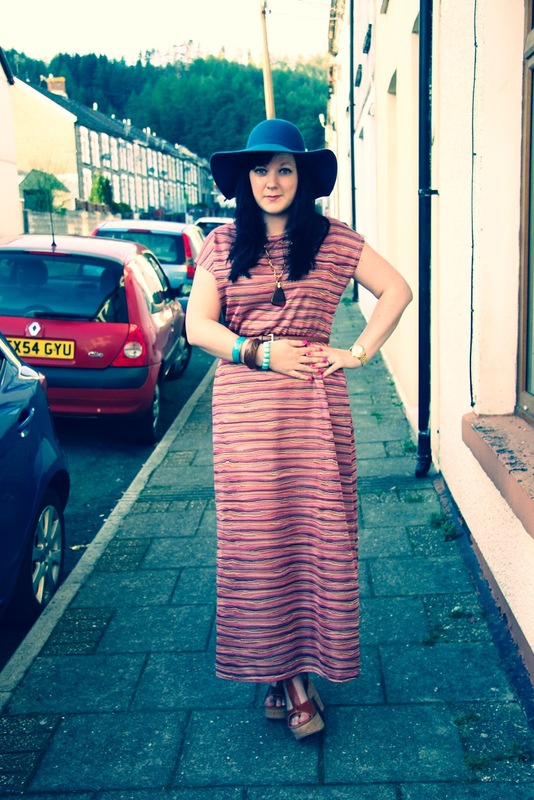 Love the maxi! love that dress, very chic.